Hannibal: It’s not enough to escape â€“ these things must be done in style. Better to get caught by the MP’s than to escape without wearing a lizard suit. Murdock: Airplane! Where’s the airplane? There’s the airplane! Whooooooooooooooo! B.A. : Shut up, Murdock, you crazy fool! You gonna be flyin’ with a fist upside your head, sucka! The Recap: We last left off with the A-Team slowly trudging toward Mexico in a fancy Gulfstream to help erstwhile reporter Triple A find a drunken colleague called Al Massey. Now the audience knows that Al Massey is being held hostage by an unnamed Tommy Chong looking dude, but Triple A doesn’t â€“ as far as she knows, he’s just pulling the old â€œuse the telegram money in my expense account to buy pornâ€ trick and is totally fine. The people I know would consider it mild overreaction if I hired an elite underground commando team to find a drunk reporter, is all I’m saying. Anyway, we’re south of the border, and Hannibal’s plan is to scam some useful equipment off the local film bureau, a surefire way to get hold of heavy weaponry even today. Face and Murdock work the scam at a nearby hotel, while Hannibal, B.A. and a reluctant Triple A scope out Al Massey’s favorite Mexican bar. B.A. explains the tao of Hannibal for Triple A: â€œYou learn to love him, mama, but it takes a long time.â€ Inside the cantina, Hannibal is just about to find Al Massey but Greedo shows up out of nowhere, pulling a gun and saying â€œGoing somewhere, Smith?â€ Turns out he’s been hired by the Tommy Chong dude to collect all the dough the A-Team got from Triple A, and if Hannibal turns it over to him Greedo might forget he found Hannibal. They go on like this for some time until a bizarre moment when Greedo misses a laser shot at point blank range and Hannibal blows him up with his cigar. Where the hell was I? Oh, what actually happens is Hannibal provokes a giant bar brawl to find Manny Cortes, Al Massey’s last known contact. This is top-quality action: if you ever wanted to see George Peppard do a spin kick or a flying body press, this is your fight scene! B.A. goes mano a mano with the large and shirtless â€œQuintana,â€ who’s played by Miguel Angel Fuentes, the fundamentalist Aztec preacher guy in â€œPuma Man,â€ and even Triple A hits a few guys with liquor bottles. Sadly, the numbers are against them, and they end up in the custody of, well, I guess the bar guys, who seem to work for Manny Cortes. No, wait, actually one of them IS Manny Cortes. And if this all wasn’t confusing enough, Manny Cortes is on the villagers’ side and wants to fight the Tommy Chong dude, which explains why he and Quintana tied the A-Team up… I guess. At last everyone’s figured out which side they’re on, so they go to the hotel pool to talk strategy. Turns out I was right on in calling the villain a Tommy Chong-looking dude, because he’s got a big marijuana operation going. Face says they can get pretty much anything they want from the film office for the movie they’re pretending to make, providing it fits with the script for â€œBoots and Bikinis.â€ Hannibal, logically, asks for an artillery gun and lots of armor plating; B.A. wants a giant garbage truck but gets a bright orange bus, which makes him mad. Hannibal gives him encouragement and calls him â€œbubbelehâ€!?! So they take a bus trip to San Rio Blanco, where Triple A and Manny hand out guns to the locals and the local underprivileged youths start following B.A. around. Honestly, what is it about Mr. T that leads every poor kid in televisiondom to follow him around? Do inner city parents just explain to their sons and daughters, â€œMy child, if you want a chance at a better life â€“ if you want to not be someone’s fool, then you must follow this man wherever he goesâ€? It seems a lot of 80’s entertainment is ripped off from this pilot â€“ the movie set car chase in part 1 was put into â€œPee-Wee’s Big Adventure,â€ and this whole scene is basically the entire plot of â€œThe Three Amigos,â€ minus all the singing. 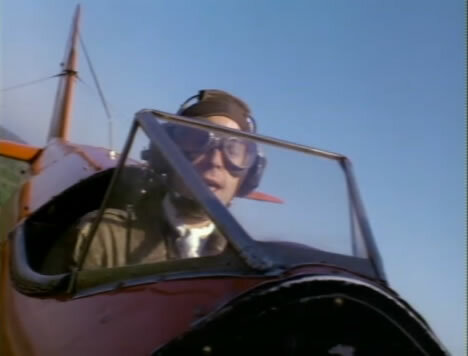 Murdock, meanwhile, is playing Red Baron in his old-school crop duster, killing all the marijuana plants and, by extension, breaking Trey Anastasio’s heart. And here come the Jeeps! Tommy Chong is back and he’s pissed, but Hannibal surprises him with a bolt of machine gun fire, a few wisecracks about his weight and a deal: give him Al Massey and leave town forever, â€œor I turn you into a taco dinner.â€ Ouch. B.A. shows up in his newly-armor-plated school bus, and I guess the fight’s over? The townspeople are happy. Viva El A-Team! Time for more local avails from Schmerler Ford. No, sorry, about 400 guerilla fighters show up and I guess they’re working with Tommy Chong because they knock B.A.’s bus off the road and take everybody prisoner. Hey, at least they found Al Massey! Fortunately, all it takes to outwit the guards and escape is for Hannibal to put on a fake beard â€“ even now I’m not sure what that was all about – and they make their getaway in a convoy truck filled with grenadas! The big chase scene plays out as you’d expect: they shoot guns and Hannibal nonchalantly tosses grenades until one of the Jeeps takes a nice big front flip into some bushes. B.A. anticipates a problem: their getaway truck is almost out of gas. â€œWhy did you pick a truck that’s out of gas?â€ wonders Hannibal. â€œBecause I liked the paint job,â€ explains B.A. Hiyo! Hannibal’s Plan B (more grenades) works nicely, though, and Tommy Chong and his highly armed friends are scared enough to surrender to the subsistence farmers carrying garden implements. â€œYou better have a hell of an apology ready, pal,â€ Hannibal tells Tommy Chong, and he’s not just talking about â€œEarache My Eye,â€ either. They head back to the airport, where Murdock finds Triple A’s audio notes for her planned article on The A-Team, called â€œLivin’ on the Jazzâ€ (!) Hannibal is mad, but she makes him a deal â€“ she won’t write the article if she gets to come along on their capers. She then drugs B.A. to get him on the plane, and she helps them put Colonel Lynch, who’s on hand at the tarmac, in the trunk of their car. They take off â€“ Murdock’s screaming in his cockpit, all’s right with the world. And thus ends the Tim Dunigan Era of The A-Team, sadly. Nothing against Dirk Benedict, mind you, but Smilin’ Tim was a-ok in my book too. Liking both Facemen is actually sacrilege among the faithful; that’s why I’ve been preemptively banned from the 17th Annual Gary, Indiana A-Team ExpoCon. But I managed to hire the guy who played Al Massey to do a drunken striptease in the middle of the autograph session. I, too, love it when a plan comes together.